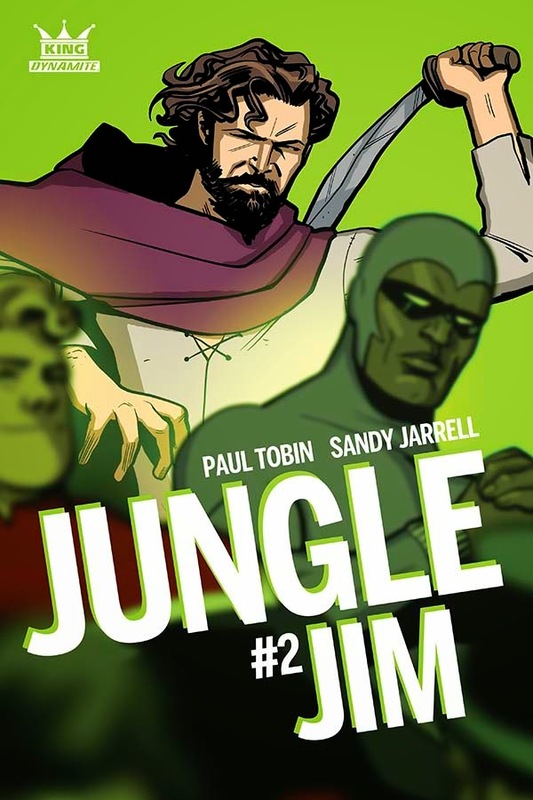 Jungle Jim #2 picks up where the debut left off with Lille and the gang finding the legendary immortal jungle mage buck naked. Whereas the first issue thrived on the strength of all the characters not named Jungle Jim, issue two is all about the fast-talking, arrogant, and overly confident animal-whisperer. It's one of the most enjoyable comics of the year. Jungle Jim, or Jim Bradley, as he was known on earth, has a unique charm that only an enlightened Englishman can. The issue uses Jim's big mouth to tell his backstory first-hand to what he thinks is an adoring audience. In most books long, forced exposition would be tedious and dull but because Jim is larger than life, allowing him to proudly discuss his favorite subject - himself - and how he was transported off earth and got his powers to control the jungle fits right in with his personality. And because Dynamite's shared "King" universe ties into Ming taking over the galaxy, we find that thread within his story as well. Jim quiets down long enough for Lille to explain to him they need his help to save her brother from execution at the hands of the evil Ming. They form a plan hilarity ensues. Sandy Jarrell has a wonderful touch with the art that is clean and clear. The scenes are bright and sunny in the jungle with special focus on facial expressions. There's a lot of smirks and eye-rolling from the other characters with a braggadocious character like Jim around. Paul Tobin has taken a classic character and made him and the people around him engaging, interesting, funny and entertaining. Jungle Jim has been one of the nicest surprises this year so far.There isn't a cynical bone in the book's body, no brooding protagonist, or cookie-cutter dystopian future. Jim is just good old-fashioned fun.